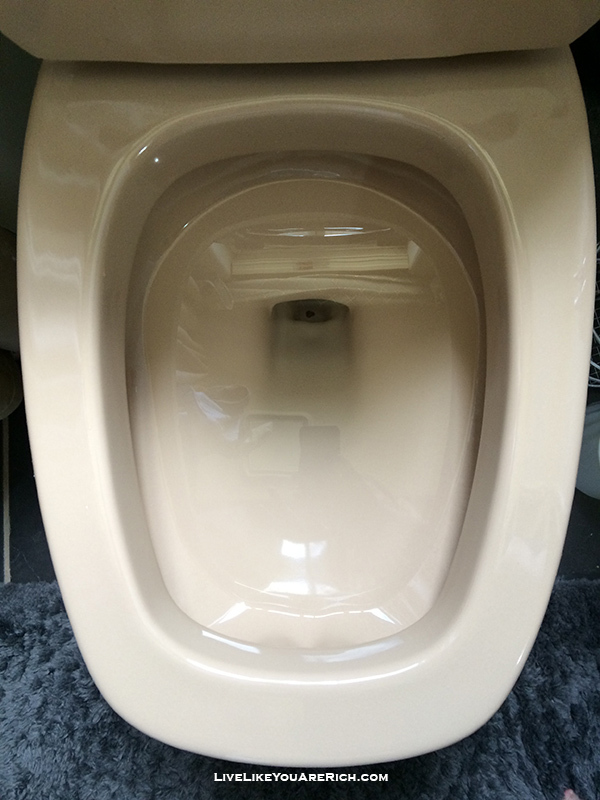 Recently, I tried an experiment of a DIY nontoxic toilet bowl cleaner I had seen used on T.V. I wasn’t sure really how well it would clean the toilet. So I tried it twice. One with fairly clean toilet, the other with a dirty toilet. I was shocked at how fast and easy it was to clean, and better yet, there were no toxic chemicals to inhale or leaks in the toilet cleaner caps (that I usually experience). 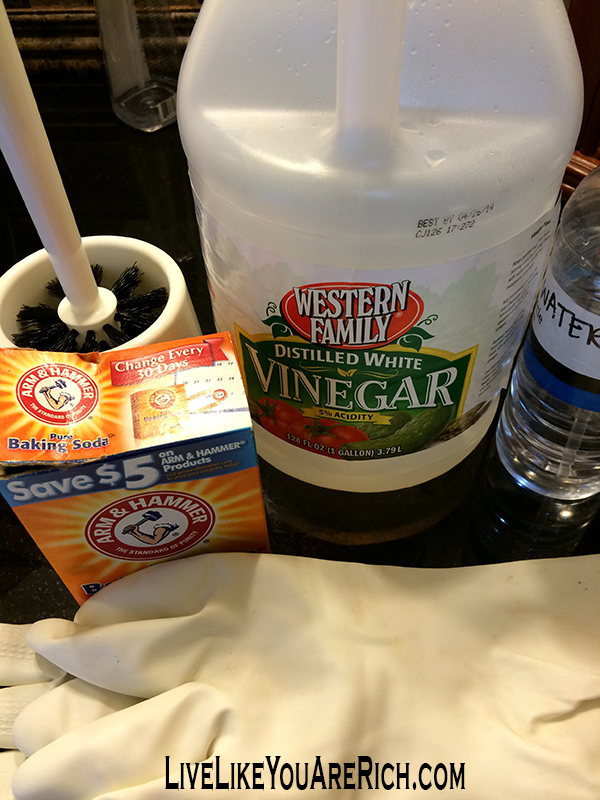 What you need: vinegar, baking soda, toilet scrub brush, gloves, and a spray bottle full of 2/3 vinegar and 1/3 water (optional)…. And of course a dirty toilet. Honestly, I debated back and forth about adding a picture of the ‘before’ or not. But I wanted a toilet that was actually dirty to test this on so I waited until mine was. The results can be seen at the bottom. If you don’t want to see the dirty toilet skim over the second photo you see. Step 1- Sprinkle about 1/2 Cup to 1 Cup (just eye it) all over in the toilet bowl. I tried to get higher up on the bowl as well. Step 2- Pour about 1-2 Cups of Vinegar into the toilet bowl. Step 3- Stand back while the mixture bubbles up and fizzes (cleans). Step 4- Take your vinegar water and spray the areas where the baking soda has not fizzled up yet (where its still solid). Step 5- You can scrub immediately (it took about 11 seconds until step 5) but I let it sit for about 3 minutes because this toilet was dirty. Then use a scrub brush and clean the bowl well, flush. That’s it. 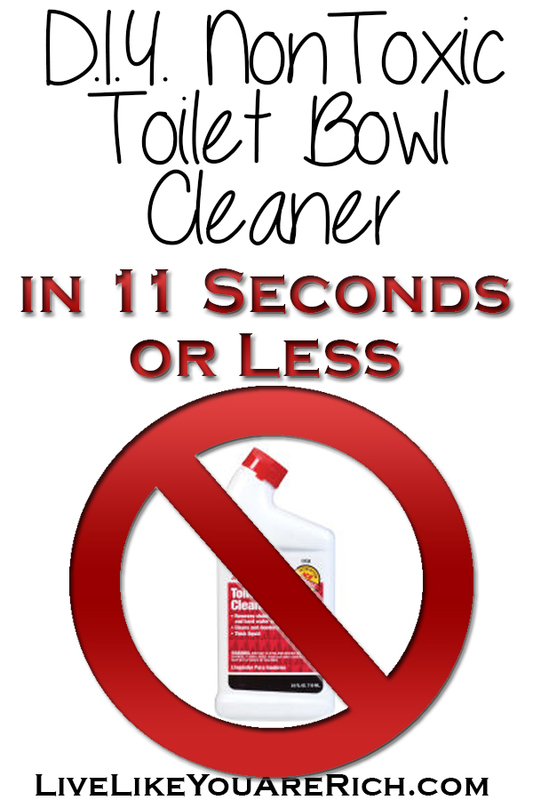 Now you can create an INEXPENSIVE nontoxic toilet bowl cleaner in 11 seconds or less as well! Check out how I clean a bathroom in 7 minutes or less using just baking soda, vinegar, and water here. For other ‘living rich’ and cleaning tips, please subscribe, like me on facebook, and follow me on Pinterest. 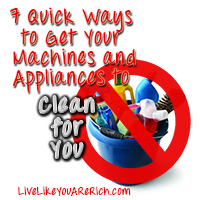 7 Quick Ways to Get Your Machines and Appliances to Clean For You 13 Clever Cleaning Tips That Increase Efficiency How to Clean Your Bathroom in 7 Minutes or Less (Using Baking Soda, Water, & Vinegar). « How to Clean Your Bathroom in 7 Minutes or Less (Using Baking Soda, Water, & Vinegar). I betcha you could clean out a commercial bottle and use it, then you’d have a bottle with a neck that can reach the underside. Marla- Great idea! It would just either have to be the vinegar or the baking soda (not combined though). Perhaps you could do a bottle of baking soda and a bottle of vinegar and then use them separately! Thanks for the great idea! Thanks Miriam! It was great to meet you this weekend at SNAP! I hope to get involved in HomeTalk ASAP! I thought I was the only person in the U.S. with that crappy stuff in my water!! The toilet in the unused lavatory lets me know it IS the water. 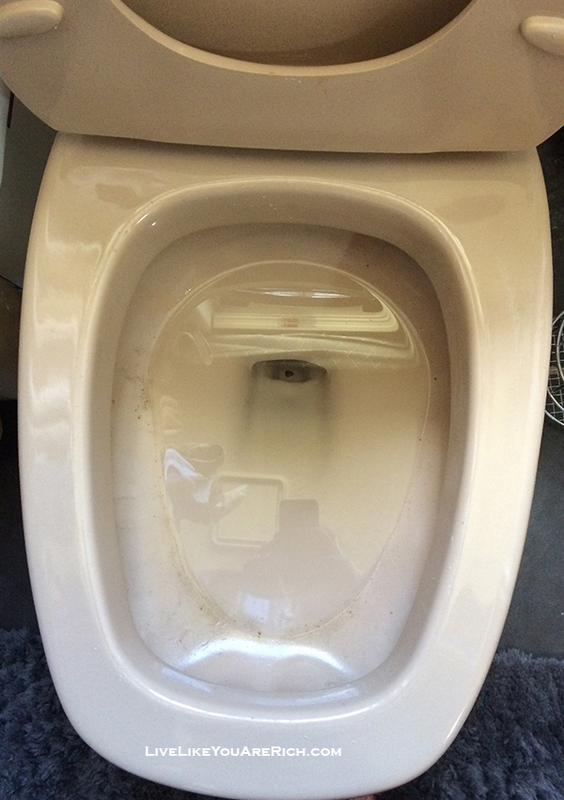 I lived in Tennessee for 57 years and never had a problem with dirty toilets and cleaned about once a week when I worked; in Ky., my neighbor says she cleans her toilets every day. I will now try your method. Cool, let me know how it turns out for you! Yeah I can’t say if it’s safe or not. If regular toilet bowl cleaners are safe with septic as I understand them to be, I’m not sure why this wouldn’t be because the reaction stops before you flush. Check back and let me know what you find! Thanks for the advice though. Love these blogs. You are all talented ladies. Thanks! A pumice stone works great for toilet hard water build up. Just use gloves. Just finished cleaning my toilet with a pumice after reading this and it worked thanks for the tip, money saver by far. You’re welcome. 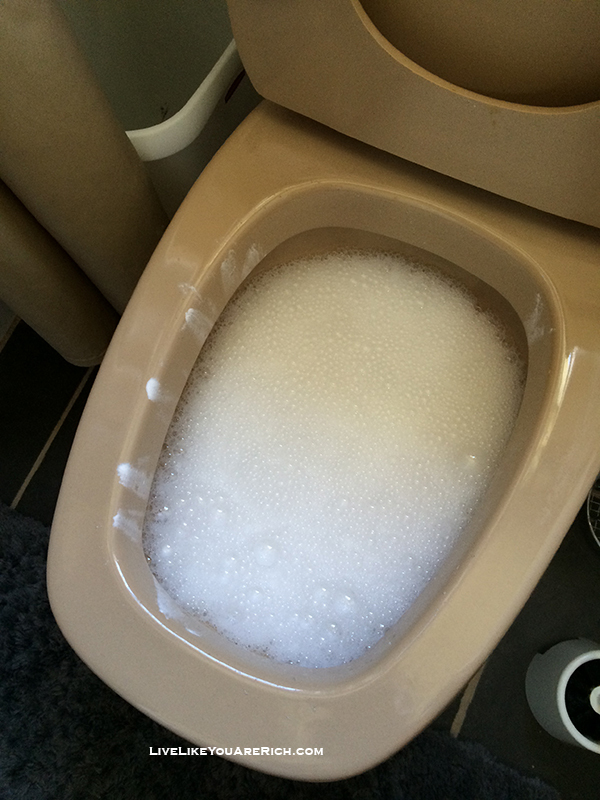 I’m glad cleaning your toilet using this method helped! You can find a pumice stone with a handle that makes it easier to get under the lip of the toilet as well. You can look at the hardware store or grocery store. The pumice stone does work real well with hard water stains on porcelain. Doesn’t the pumice scratch the porcelain? It’s good for septic systems! Trying this today! Yes it is. Let me know how it goes! It really does do a great job! I don’t get why this is better? is it a cheaper option or or are the commercial toilet cleaners unsafe healthwise or something? Cuz I see a lot of these DIY cleaning tips and they almost ALL include vinegar and baking soda but these items aren’t free. In my country they are rather pricey! So why would I choose these over buying a bottle of toilet bowl cleaner off the shelves at the store? I guess I need some more education on this topic. It is much cheaper for us in the states (vinegar and baking soda are really inexpensive here) and more environmentally friendly—esp when people have septic tanks. Toilet bowl cleaner for us is kind of pricey and I have problems with the caps breaking quite often and leaking. And its safer for kids. That said if none of those issues apply to you, just use regular toilet bowl cleaner. Thanks for asking! Commercial toilet cleaners contain many toxic chemicals which are harmful to your brain, lungs, and liver, not to mention the environment. Baking soda and vinegar won’t fill the air in your house with toxins. If it isn’t safe enough to eat, it isn’t safe to breath in or put on your skin. I use vinegar for a lot of my cleaning. A 50:50 mixture of vinegar and water leaves streak free mirrors, especially if you use a coffee filter to wipe it away (same with windows). Also, I put baking soda down my bathroom sinks and then follow with vinegar and let that sit. Then follow that with hot water. This works to somewhat declog a drain and freshen it up. Any time a natural cleaner can be used, it is better for your family, your home, and the environment. No harsh chemicals for you to breathe and no chemicals being flushed into the septic system. Baking soda and vinegar are very inexpensive in the US, where the author lives. I find the toilet bowl cleaner great! I am glad that I found your cleaning recipe. The pictures are really helpful! Thank you! Sprinkle? Don’t you mean SPRAY? I ask because there is liquid here your using. Maybe you type the wrong word. I was referring to the baking soda. Sprinkle the baking soda- it is not a liquid. Then pour in the vinegar which is a liquid. Best! Awesome! Thanks for sharing this awesome tip! I have cleaned toilets with this method for quite some time. I use a Dollar Tree shaker jar to sprinkle the baking soda. It’s one of those glass jars with the holey metal lid, like the kind pizza restaurants have on the table filled with Parmesan cheese or crushed red pepper flakes. I find it’s the best way to get the baking soda in all corners of the inside of the bowl. Also, letting the baking soda and vinegar sit for 10-15 minutes before scrubbing helps to easily dislodge tough spots. Awesome! Great idea on the pizza shaker! Thank you. You can also use an empty, clean, plastic parmesan cheese shaker container (the kind with the green lid). Works great to sprinkle baking soda on carpets as a deodorizer, too. Great tip and very creative to use it on other things. Thanks! What a great idea! I have used baking soda and vinegar to unclog drains. I never thought to.use it for cleaning. Will be trying this later today. I have asthma and really do not like using the chemical cleaning products. Thanks so.much for this idea. You’re so welcome! I’m glad you found it especially because of your asthma! I thought that baking soda and vinegar neutralized each other? I read that they create a chemical reaction that doesn’t clean, it just makes bubbles. I have used it to clear a drain clog, which worked. Thanks for the question. All I can say is it cleans great for me (and many others who have commented. I’m no scientist but it works for me! I heard that the vinegar will break up clogs in the toilet. My granddaughter uses excessive amounts of toilet paper and we have had an “explosion” of toilet stuff overflow. Once I discovered that vinegar will help break down the toilet paper, I haven’t had an overflow, but again, I’ve told her 7 pieces of toilet paper for number 2 and no more. But for real, who counts sheets of toilet paper? Great tip! Thank you. Haha your granddaughter sounds fun. Our plumber said bleach is terrible for septic…. I am fixing to go clean my toilet. Whit all the good results I am sure it will sparkle. Thanks for the tip. You’re so welcome. Let us know how well it cleans! How is it as a disinfectant? I love the idea of a sparkling toilet, but I am really concerned about smelly bacteria. I’ve used vinegar and baking soda for years to clean kitchen and bathroom sinks. Together they can clear a slow running drain in 3-4 minutes (pour in a little vinegar – sprinkle in a little baking soda and pour in a little more vinegar – it will BUBBLE LIKE CRAZY – then flush with hot water) and it doesn’t take much of either one. You have a lot of flushing water in the toilet bowl. In our country we have less than half that in the bowl. You are wasting good water I’m sorry to say. I use this method too. No chemical cleaning in my house. Soda and vinegar and water. And hard work. You’re seldom hurt by hard work. A better alternative to pumice is to us 1000 grit wet and dry sand paper. 1000 grit wet and dry paper is very fine and will not scratch. In many instances the wet and dry paper will clean everything without any chemicals, just a little light scrubbing will take care of most stains. A pack will last for years and most of the time the paper can be reused as it rinses clean after using. Awesome, I never thought of that. It is a better idea than pumice for sure! 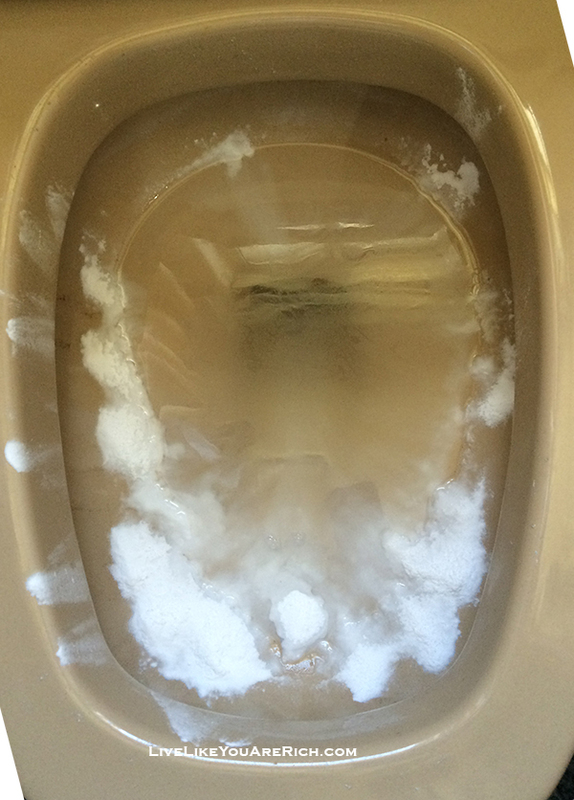 It is very important things to clean our toilet properly.We Should clean our toilet after per 15 days of the month. I have read your article very attentively really it is very efficient for us to clean our toilet in very proper way.as i know bigdealhq.com is a great source proving the home cleaning tips like you. Thank you very much sharing this effective post. 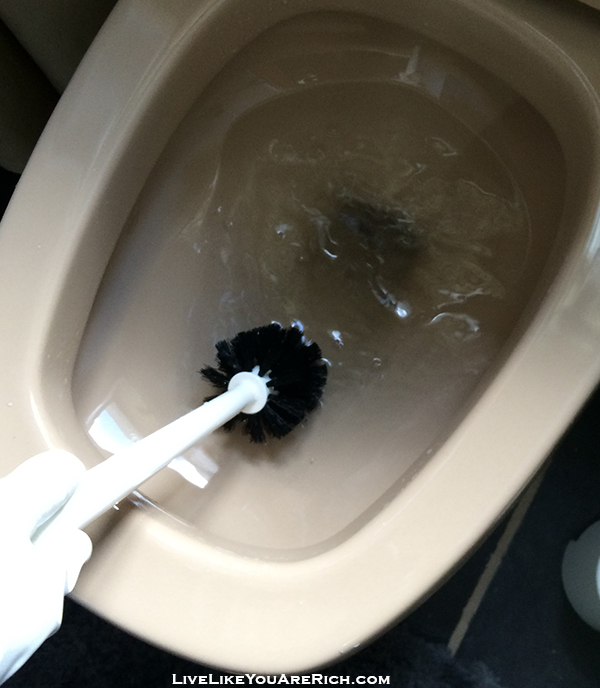 Toilet cleaning is one of the important daily activities for home lover. Every family member love spark toilet So, You should know which toilet cleaning product perfect for to get sparkling clean toilet. Visit here to know more about top quality toilet cleaning product toiletrated.com. Very good will help me a lot in cleaning the bathroom!